There are many different approaches to smart devices you wear on your wrist, and I’ve worn quite a few of them. There are smartwatches, which extend the functionality of your smartphone, like the Pebble, the Samsung Galaxy Gear, and the Martian Watch. 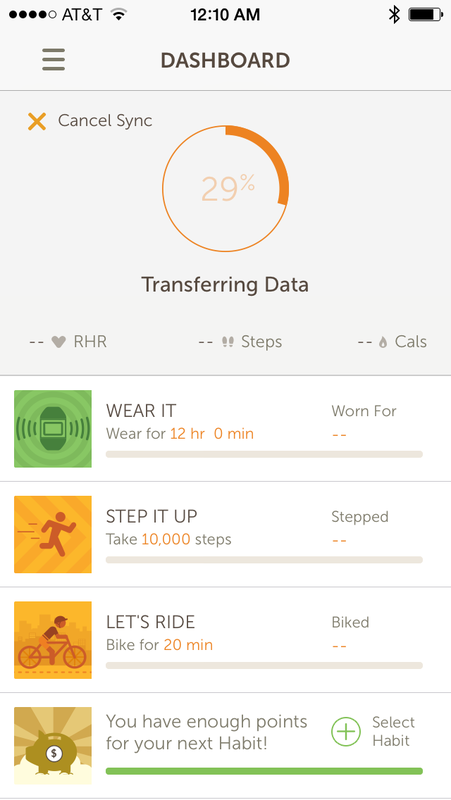 At the other end of the spectrum are the lifestyle devices that monitor motion but provide little information on your wrist, like the Jawbone UP, the NikeFuel devices, and the Fitbit devices. Somewhere in between are exercise watches that work with a chest-strap heart-rate monitor, like the ones from Garmin or Polar. Recent technology advances have offered the promise of devices that combine these approaches with the ability to monitor your heart rate from your wrist. I’ve spent the last two weeks wearing one such device, the Basis Health Tracker. What if you woke up as the most super human version of yourself? 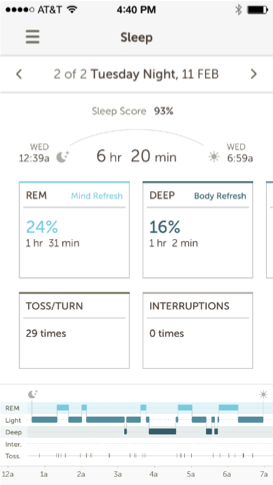 Introducing Basis, the most advanced health tracker in the world, which tracks light, deep, and REM sleep to calculate your own personal sleep score. It’s time to get serious about your sleep! Unfortunately, the Basis falls a bit short of those claims. At the same time, it is a fascinating glimpse into what the next generation of devices will do. 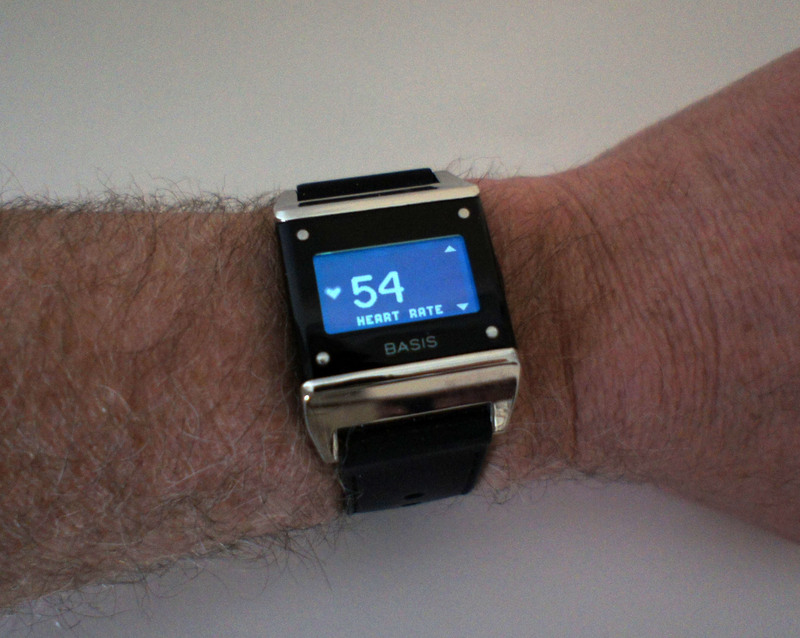 The Basis monitors heart rate, skin temperature, and perspiration from your wrist. That means you can track your heart rate 24 hours a day without wearing a chest-strap heart-rate monitor. 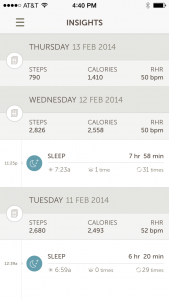 The Basis also detects motion to count steps and monitor how you are sleeping. 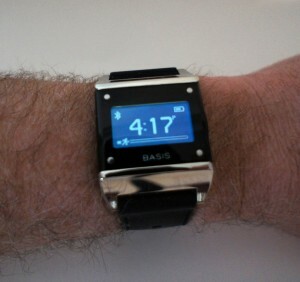 The Basis watch I’ve been wearing is decent looking. By default it displays time, battery life, and an activity progress bar with no backlight. Four small buttons on the face allow you to turn on the backlight (as in the pictures) and see the date, your heart rate, the number of steps you’ve taken, calories you’ve burned, and some additional exercise info. Pushing a larger button on the right side of the watch allows you to upload the data to your smartphone through Bluetooth. I tested mine with my iPhone 5s. Once you upload your data either via your smartphone or a computer connected via USB, you can look at it in much greater detail. Studying my data, it is apparent that I don’t sleep well enough (or long enough), and I don’t walk nearly enough on most days. The details are often fascinating. You can look at your sleep and see breakdowns about how long you slept, how deep your sleep was, and how often it was interrupted. 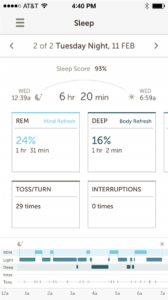 Unlike devices like the Jawbone UP or Fitbit, it determines when you are sleeping rather than relying on you to remember to push a button when you go to bed and again when you get up. 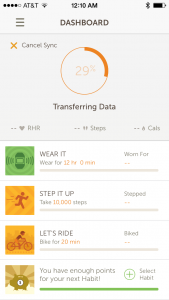 To help you create healthy routines, the smartphone app and Web site also include suggestions they call habits, such as wearing the watch for more than 12 hours a day, walking at least 10,000 steps, or sleeping a certain number of hours. You can qualify for additional habits by earning points from successfully completing the ones you already have. Basis sends emails encouraging you to do more, congratulating you for accomplishments, and so on. Despite the wealth of data, I ended up being frustrated with the Basis. For example, the sleep data often divided my sleep into multiple segments and would not allow me to permanently merge them. In one silly example, it decided that a segment from 5:30 to 6:30 in the morning was not part of my sleep from the day before, but from the next day. So, according to it, I slept way too little on one day and about the right amount the next day. I really need to get more sleep. The Basis’ heart rate measurements seemed generally correct but inaccurate at any given moment. For example, it indicated no change in my heart rate after running up two flights of stairs, while at one point during a normal day without exercise, it said my heart rate was 143. If my heart is racing at 143, I know it! The heart rate the Basis displays also lags enough to limit its usefulness for exercising. I wore it during a two-hour cycling spin class. It would often (though not always) be 30 seconds or a minute behind; when the heart rate from my chest-strap was 140, the smartwatch was still only 125. Sometimes, it would never get around to registering my real heart rate. For example, the Basis never hit 140 during the class, even after I spent several minutes at that rate. 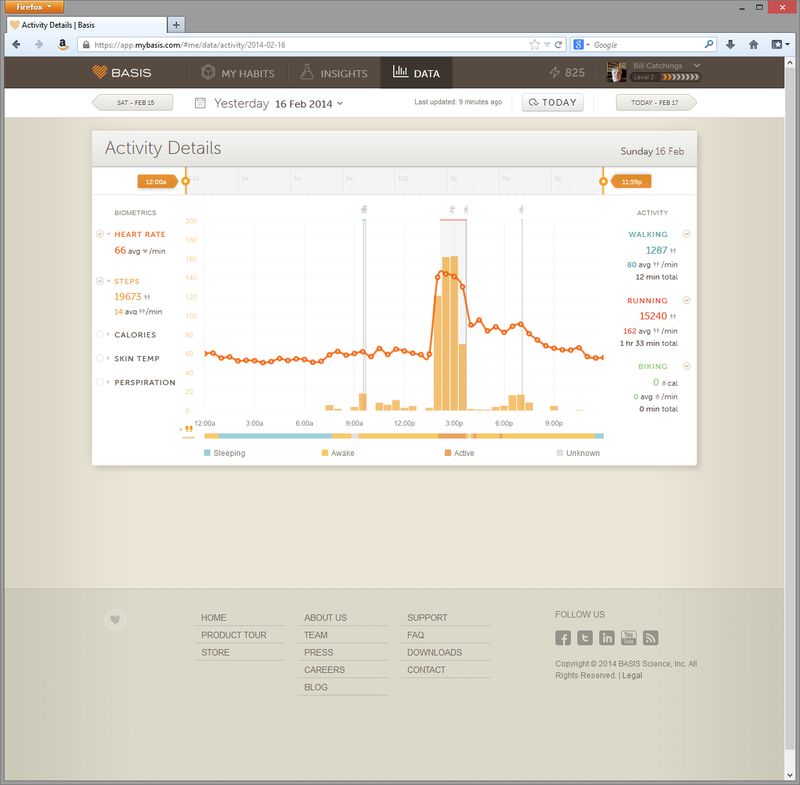 The Basis Web interface shows lots of details such as the data here from a day including a run. I also tried running with the Basis on one arm and a Garmin Forerunner 220 (a GPS watch with an ANT+ heart rate chest-strap and lots of exercise features) on the other. 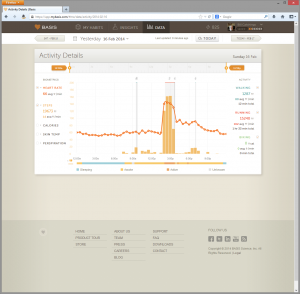 The screen shot shows the heart rate data from the whole day, including that run. Again, there was some lag in the heart rate numbers, but this time they were generally correct. 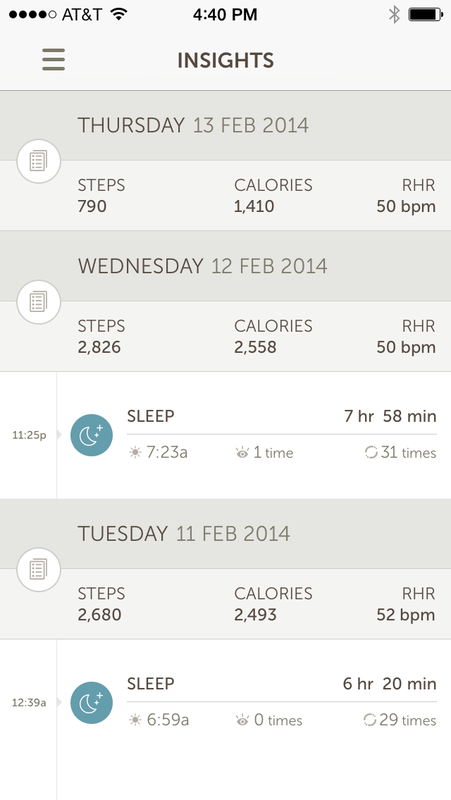 My Forerunner 220 recorded my heart rate at an average of 149, about what the Basis showed. One interesting bit of data from the graph is that it shows my heart rate continued to be higher than normal for much of the remainder of the day. A key problem with the Basis is that it is very difficult to tell the difference between errors and interesting data. I’m suspicious and don’t quite trust the data. Maybe my heart rate is higher for a few hours after exercise. Who knows? On the plus side, most of the issues are ones that newer versions of the software may fix. Despite the Bluetooth connection to my smartphone and the decent watch face, the Basis makes no attempt to be a smartwatch (like the Pebble). Getting even a vibration on my wrist when I get a phone call or text while running would have been very useful. The Basis is also not really an exercise watch (like the Forerunner 220). Instead, it is more like the Jawbone UP, Fitbit, or NikeFuel, but with the addition of a watch face and some additional data. The bottom line is that I’m looking forward to switching back to my Pebble – or trying out the Mio ALPHA or Kreyos Meteor when they arrive. With so many interesting wearable devices on the horizon, the Basis does not live up to its promise well enough to keep me wearing it.